Thomas “Big Foot” O’Folliard (1858-1880) – An outlaw cattle rustler and friend to Billy the Kid, he was second-in-command in Billy the Kid’s Gang. Born to Irish immigrant parents, Thomas was orphaned as a boy when his parents died of smallpox. He was then raised by relatives in Uvalde,Texas. He began his life of crime by stealing horses with a man named Emil Fritz, who would later fight as a gunman in the Lincoln County War of New Mexico. It would be through Fritz that O’Folliard would wind up in New Mexico and meet Billy the Kid. 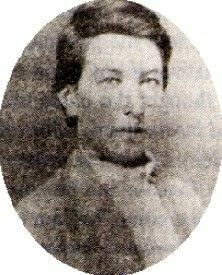 Both of them, along with Fritz, would align with the Alxander McSween faction in the Lincoln County War, during which O’Folliard took a bullet in the shoulder. When the feud was over, Thomas spent the next two years with Billy the Kid rustling cattle in the southwest. As the men gathered more outlaws around them the group became known as Billy the Kid’s Gang, of which O’Folliard was second-in-command. The gang and all of its members soon had a price on their heads and were relentlessly pursued by Sheriff Pat Garrett. The band was able to stay ahead of the law until December 19, 1880 when they road into Fort Sumner, New Mexico. There, Pat Garrett and another lawman by the name of on Lon Chambers lay in wait for them. When O’Folliard and Tom Pickett were riding down the dusty street, Garrett appeared and ordered them to halt. Instead, O’Folliard went for his gun and was shot in the chest. In the meantime, Billy the Kid and the rest of the gang, including Tom Pickett, made a hasty retreat out of town. Thomas tried to follow them but was too weak and said to the lawmen, “Don’t shoot Garrett. I’m killed.” He then plead with the sheriff to put an end to his misery but Garrett refused. He died approximately 45 minutes later and was buried at the old Fort Sumner Cemetery in a plot that was later shared with his “pals” Billy the Kid and Charlie Bowdre. He was just 22 years-old at the time of his death.